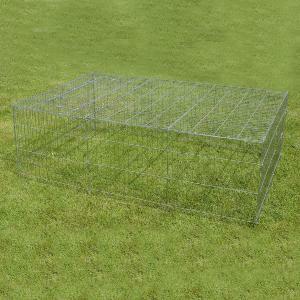 The Harrisons Appleby Small Animal Pen & Chicken Run is a high quality, zinc-coated steel run. It has one door in the roof and two on the narrower sides for easy access. It can be erected and dismantled in a matter of minutes to allow for storage when not in use and comes with a set of easy to follow instructions. A great way to let your chickens rabbits or guinea pigs run around your garden. Comes complete with a detachable cover so you can allow shade for your pet. The bars are 3mm thick and have a 3.5cm spacing.